Keeping up with interior design trends is important to the successful marketing and sale of your development. 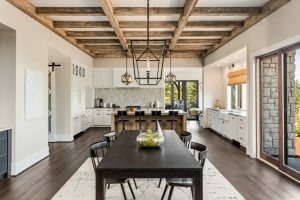 From the color of the year to the latest trends in fixtures and finishes, 2019 promises some interesting options. Here, we look at a few trends to consider as you make your design decisions in the new year. First, let’s talk about the color of the year. When Pantone releases a new color of the year, it always makes an impact on interior design. This year’s choice, Nightwatch green is a deep shade, moodier than hunter and bottle green, and looks amazing next to high-shine finishes. A little goes a long way, so look to Nightwatch green as an accent if you’re not willing to commit. Convertible dwellings are all the rage. From Murphy beds to moveable walls and built-in shelving, convertible design is often the perfect solution for many of today’s smaller condominiums. This trend combines style with practicality, and allows for living space that’s truly livable. Believe it or not, Terrazzo is back. It’s actually not that surprising that this material, made of chips of marble, quartz, granite, and glass is making a comeback. It was ubiquitous in the 60s, and the recent popularity of mid-century modern design continues to grow. It’s an interesting material, and can be used in different applications, from flooring to wall tile. Accent walls are being replaced with statement ceilings. Not since the roaring 20s, with its ornate molded tin ceilings, have we seen ceilings garner so much excitement. Whether they’re painted, lacquered, wallpapered, or covered in molding, the right ceilings can add interest to a property and make it seem larger and more memorable. Eco-friendly is a trend that’s not fading away. In fact, with the environment in crisis, people are increasingly looking for new ways to reduce their own carbon footprint. This shows up in design, with materials like marble being repurposed, and living spaces and appliances are being designed to save energy. Pre-development planning and design is a critical component to a successful real estate development from floor plans to finishes and fixtures to amenity spaces and model homes, and we have the market knowledge and experience to add value to your real estate development. SagePoint understands the ins and outs of urban and resort real estate development marketing and sales, and our experience keeps you at the forefront of the industry, with the professional marketing, sales and advisory services you need to stay on top. When we’re part of your project from the very start, you can expect your property to be positioned, designed and built to target your market and maximize your returns. To learn more about our services, please contact us online or email us at inquiries@sagepointre.com.